Have you ever wondered, what would the Kamitic people do if they were alive today? I thought about this because I was recently asked by a family member if I was trying to rebuild the Kamitic civilization of old because of my interest in the Kamitic tradition. I told them that I use to be only concerned with doing that when I first learned about Kamit history and their cultural tradition, because it was the fun and the conscious raps of hip hop along with Afro-Centricity that helped me to escape the crack ridden streets of Detroit in the mid-1980s; and kept me from making some bad decisions when I use to live in Philly. So I felt obligated in a sense to rebuild the Kamitic civilization of old but, things changed once I was fully initiated or anointed. It began when I moved to Florida, there I met an old black Cuban man that changed me perception of things, whom I call in the book Papa Raul. Although he had not read all of the books that I had read about the Kamitic culture, history, religion, tradition and way of life. He was the one that made the greatest impact in my life by fully initiating me into the Kamitic mysteries and Kamitic way of life (Explained near the end of this post). Papa Raul in a lot of ways reminded me of my grandfather with the only differences being that he spoke Spanish most of the time, was a Babalawo in the Santeria religion, and a member of the Abakwa Society. He was a very wise man and I learned a lot of things from him as if wisdom was just seeping from his pores. Papa was a godsend (which I will explain later), but when he had learned that I was studying the ancient Egyptian tradition. He scolded me and told me that what the Ancient Egyptians did in Egypt was what they had to do to survive during that time thousands of years ago. Here in the United States things are completely different, so you can't do things like these people did thousands of years ago. He basically told me that I had to do things different because culture never stays the same. Cultures that remain static basically become forgotten and lost in the sands of time. Papa told me that the only way adapt is to focus upon the concepts and principles. It took me a long time to figure what he was saying, as the old proverb goes, "Wisdom is like a mushroom, once you eat it, it is usually too late". But, when I finally got it, it all began to make a lot of sense. Failure to understand concepts and principles is what leads to individuals adopting other peoples' cultural perspectives, practices, understanding and neglecting one's own. It is in my opinion one of the main reason for so much religious and spiritual confusion in the world, because people just accepted certain things instead of stilling their mind to hear the Voice of God speak from within. I believe the lack of understanding true concepts and principles is also the reason why other people's faiths don't work for everyone. Now don't get me wrong, I am not saying that we can't learn from other cultures...no, we were all put on this planet to learn from each other and help each other. No man or woman for that matter is an island. We are all like cells in a large universal body with a purpose and interdependent upon one another regardless if we see it or not. But, when you don't focus upon the concepts and principles, it is easy to get lost in the physical and cosmetic forms. The next thing you know, you're walking around wearing someone else's garb with no idea as to why you're wearing it and what it means. Then it sets in, cultural confusion and deviation. I always ask the question, if the Kamitic people were alive today what would they do, how would they dress, what would they eat, etc.? Would you do everything that they did? Yeah, when you look at it from that perspective it becomes a little clearer that we are a little old to be playing Follow the Leader. God gave us all a brain, or shall we say a conscious so it is our given right to develop and use it. Anyway, it was this understanding that made me put down my books and go inward. When I did that, that's when my experience and spiritual quest took on an entirely new meaning. That's when I discovered that the Kamitic word "ra" was used like a prefix and suffix in numerous Kamitic words, similar to how the Semitic "el" is used in words like El-ohim, El-shaddai, Ang-El, Gabri-El, and Isra-El. It was this realization that made me conclude that "ra" which means power, strength, etc. when used to describe the power of God was called Ra or Rau. Divine Manifestations or Divine Manipulators of this Divine Power were Khepe-RA, Ra, Ra Atum and Amun Ra, which are all hinted upon in one of the most fascinating and informative Kamitic stories written, and true Kamitic Cosmology or Kamitic Creation Story and Purpose, called the Story of Ra and Oset (See the Ra and Oset). It was this understanding that gave birth to the maa aankh, a spiritual blueprint or cosmogram inspired by the Bantu-Kongo Cross but based upon the Kamitic concepts and principles. Please note that there were several initiation systems that existed in Kamit. Kamit did not have a Pan-Kamitic religious systems, but like most indigenous people they believed in one Supreme Being whom they called Nebertcher - The Lord of Everything, and under God was spiritual entities pertaining to one's geographical standings. Fisherman for instance didn't pray to God for a bountiful agricultural harvest, they instead prayed to be successful in catching fish. The same applied to every other profession. Life from the Kamitic perspective wasn't defined as being part mundane and part spiritual. Life was circular, the material and spiritual were interdependent upon each other, just man and woman are interdependent upon each other in order to conceive a child (Life). Becoming more spiritual was reflected in one's material standings and vice versa. This is the problem with Western medicine and Western approach to dieting in my opinion, they focus solely upon the material - the physical body. The Spirit knows what our body needs, it just needs us to put forth the will to do it. (Sorry for the tangent). Anyway, thanks to Papa Raul, who by the way disappeared out of my life just as mysteriously as he appeared, (which is why I called him my Cuban saint in my book) I was able to focus upon the concepts and principles that led me to discover the maa aankh, which gave me new insight on a lot of things. It is the basis of what I was instructed is the Kamitic shaman tradition. It was through the maa aankh I began to see that my meeting with Papa was not by coincidence, it was by some invisible design, which helped me to realize that God can use anyone to give us a message. We just have to be receptive and open-minded. If I was close-minded, stubborn or arrogant, I would have missed what God was telling me through Papa. Since Papa was the instrument that got me on a different path and made me see things differently. I consider Papa who by the way, was a child of Ellegua - the Yoruba orisha/guardian spirit Opener of the Way - one of the main individuals responsible for initiating me further into the mysteries of Kamit. To a lot of people this may seem strange because most of the time when someone says initiation, it conjures up images of being led around blindfold like the brothers of G-Phi-G in Spike Lee's School Daze or the recent cult film The Skulls. While formal initiation like these still occur to some extent, LIFE has a way of initiation us as well, because initiation means to commit, pledge or take an oath to refine our choices in life into the world of the unknown. Some of our first initiations in life were crawling, first steps to walking, potty training and so on. So Papa helped me to take my real steps into the Kamitic mysteries of life. Like any true initiation, once you are initiated you can't go back to the way you were, just like an adult (in general because some ppl. try - smile :) ) can't revert back to a child. Initiations sparked by life are what some like Arthur Flowers and the Orb of Djenra call anointing, which occurs when our God-given talents are awakened. We have all heard of entertainers being anointed. John Coltrane for instance, was anointed. There are a lot of singers that are anointed, then there are some that aren't and they are just singing...ie. how can a 17 year-old tell me about love. They have only been on the planet for 17 years and half of that time they weren't even conscious decision makers. They have no true initiation (understanding) into the mysteries of the heart or love. They therefore have no anointing. 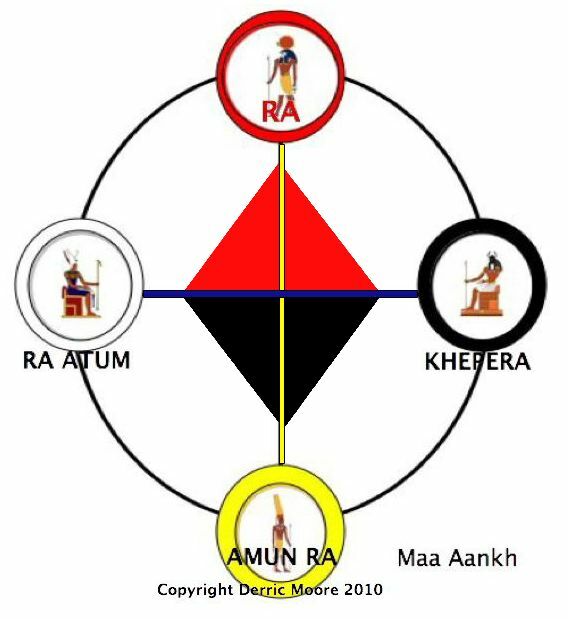 This is what the maa aankh helped me to understand and it became apparent to me, that although our ancestors brought to North America were not able to maintain all of their cultural practices, to conduct formal initiations as is done in the Caribbean and Latin America. They were however able to retain enough information (hence concepts and principles) to lead us back to the way things were done. I explained to my family member that it is for this reason and understanding, that I can't erase or unlearn what I have learned about our past. I can't undo the initiation experience because what was done is done. All of the pruebas (things that people go through that increase your awareness, spiritual prowess, etc./spiritual tests) is a part of life. So, I had no purpose or reason to rebuild, reconstruct or recreate the old Kamitic way of life, because it was already mine. Kamit was built by our ancient ancestors, so there is no reason to reconstruct and recreate what they did thousands of years ago. I told them and I felt good saying it because I was no longer searching for God that, it is more important that we simply remember what our ancestors did in order to address the social ills that exist in our homes, communities, societies and environment today. And, this is how I think the Kamitic people would have done things, had they been living with us today.